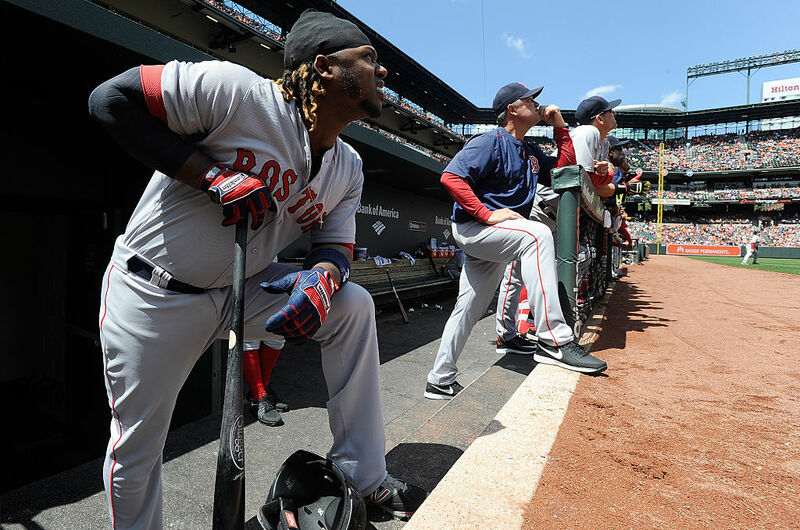 The Boston Red Sox are known for their hitting prospects of late. Mookie Betts, Jackie Bradley Jr., and even the not-yet-promoted Yoan Moncada are three of the many positional players who came out of the Red Sox farm system in recent years — each with an elevated prospect status. But just because Boston has been successful in developing hitting talent doesn’t mean the team lacks pitchers hiding in the minors, as well. That’s extremely important, because the Boston Red Sox need more starting pitching. One of the pitchers who may have a bright future in the MLB is right-hander Michael Kopech. Standing at 6-foot-3 tall, the big, powerful starting pitcher was drafted out of high school by Boston in the first round of the 2014 amateur draft. The Red Sox immediately sent him to the rookie league, where he put up less than impressive numbers in his first professional season. That first year, Kopech tossed just 13 1/3 innings with a 4.72 ERA, striking out a solid 10.9 batters per nine but walking 6.1. Control issues are not uncommon for young players, especially the kind who move from high school to facing professional hitters on a regular basis. But it became clear to anyone who watched Kopech in the early-going that if he could get himself under control, he could be a special pitcher. Fast forward, and Kopech is starting to showcase his raw talent. He’s started 19 games since the beginning of the 2015 season, tossing 83 1/3 innings while striking out 97 batters. That’s impressive enough, but what’s more notable is just what makes him so difficult for hitters to handle when they step into the Boston Red Sox batters’ box. What is so amazing about Kopech? Well, he has three quality pitches, with a slider and changeup acting as his secondary and tertiary pitches. Both have potential, with Kopech’s slider a slightly above-average pitch. But the showcase here is the heat on his fastball. The pitch sits in the upper 90s and has late sink, which could make it unhittable — especially when paired with his softer slider. They were telling me about it. They saw 105 on the gun, and then saw it on the gun in front of them, and the people in front of them turned around and said, “Did you see that?” They were like, “Yeah, we got the same thing.” I think everybody was a little shocked to see that number pop up, but I try not to pay too much attention to it. It’s good to know my name is out there for a good reason right now, but I hope people look at me as a pitcher now, and not the immature kid that they’ve been looking at me as. I’m out here trying to prove myself right, but there’s a lot of people I want to prove wrong. My focus right now is to pitch, and hopefully, everyone sees that. Kopech’s thoughts on people viewing him as an immature kid aren’t necessarily wrong, especially given his recent history. His last two seasons were shortened when he broke his hand in a fight with his roommate and tested positive for a stimulant — good for a 50-game suspension in minor league baseball. Not exactly the things you want to hear from a top pitching prospect. But both the Boston Red Sox and Kopech hope those days are behind the strong, young stud pitcher. If there’s one aspect on the MLB roster where Boston needs a lot of help, it’s with the pitching staff. We’re not suggesting that Kopech will necessarily be called up this season, or even the next. But we can imagine what that fastball-slider combination might look like if he were utilized out of the bullpen to ease him into the MLB. Of course, Kopech’s stock on the field is still improving. Prior to 2016, Baseball Prospectus ranked him just the 98th best prospect in all of baseball, which likely has to do with his questionable history, the lack of time on the field, and all the walks. He’s only pitched in 14 innings so far this season, but he’s already issued seven free passes. If Kopech can cut down on the walks and learn to better harness his impossible-to-hit fastball, we could see the beginning of something special. It’s not every day that a fastball breaks 100 mph, much less comes in at 105. There will be a lot of eyes on the best pitching prospect in the Boston Red Sox farm system. The team hopes this means Kopech has matured personally and turned into one of the best young starting pitchers in the game. Statistics courtesy of Baseball-Reference.com and Baseballprospectus.com.